Yipee! Amelia learned how to get down the stairs by herself! We've had a full week so far. Tuesday morning Miekka watched Amelia while I attended another photography class through Pictureline. I am really impressed with their classes! This class encompassed the art of Photo Journalism and composition. Seth started his first day of Kindergarten that same afternoon. I picked up Amelia about the same time so was able to witness the excitement and nerves of his first day. Miekka and I spent a ponderous hour at Pine Needles in Gardner Village picking out fabric for her car seat project. She finally settled on a super-duper cute orange, green, and brown pattern that screams Miekka. I spent more money than she did picking up fat quarters and single 12 inch panels for appliqueing. Wednesday at Walmart their summer "Geranimals" shirts were on sale for $1 (usually $4). Yah, I picked up 21 shirts. My good friend cleaned out the rest of the their stock. Maybe we should open a shop on Etsy making outfits! 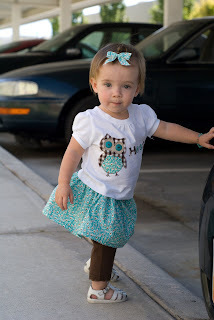 I sewed a cute skirt to match her owl shirt after my Walmart find. I will be rich!!!!!!! LOL...NOT. De-bo called needing some company so Amelia and I drove over there and spent an hour chatting with "Auntie" De-bo. Around 7 pm I met Cammie and Michelle at Dairy Queen for some adult-level interaction. 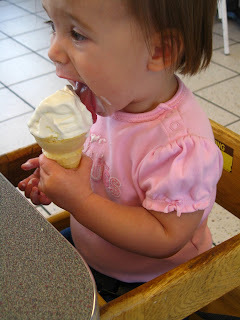 Amelia devoured her own cone using her long-tongue licking skills. 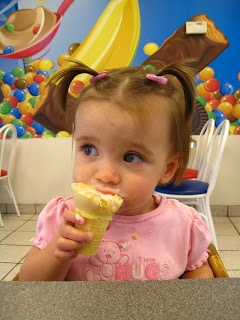 I enjoyed my own cone with deliberate slowness to prolong our visit. I felt like a better person after visiting. These evenings when Justin is gone can be hard. Today Amelia and I met a good friend, Emily, from DWS for lunch at my favorite Noodles and Company. I am always amazed at how many times DWS changes for the better and worse in a matter of weeks. Speaking of DWS, I recently had a dream about going back to work for them. Sean called me up and offered me a 6 month job for $7000. I agreed because then I could get my coveted camera and lenses. Amelia came with me to work and visited all the cubicles and took naps under the desk. She was an angel (first dose this was NOT real). My job entailed compiling a photographic yearbook covering the past 7 years of employees. On my last day of the job the only person left to photograph wouldn't sign the model release form. Sean couldn't pay me until the picture was taken. I woke up in complete anguish...so close, yet so far away. I had a fun but stressful photo session with my two cute nephews. The stressful part came when Amelia woke up from her nap in a cranky mood. She flailed on the floor hurling long gooey strands of snot while I continued to photograph and ignore her. Still my blood pressure was up from trying to ignore her and wanting to lull her back to sleep. The boys were really handsome and hammed up to my camera. Catherine invited me over for a little while for a mini-photoshop lesson. I showed her how to apply grunge textures to photos. My new next door neighbor is turning out to be a flaky renter. She still has not paid the deposit or rents. Kenny came over this evening and changed the locks. She seems nice but possibly sketchy. I'll be spooning with Justin's Khar pistol tonight just in case!